Self-professed baseball nerd Keith Olbermann frequently fills his spring training columns with "back in the day" photo scans that show active managers on cards from their minor league days. 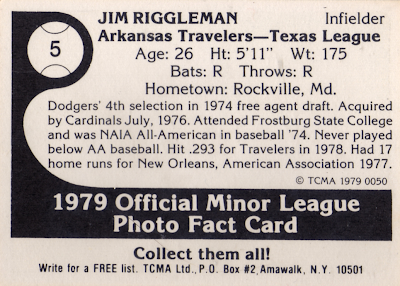 The Washington Nationals' Jim Riggleman already appeared in at least one of those ("A Hairstyle is Temporary; A Baseball Card is Forever"), but I'm happy to feature him in another. Check out that boyish enthusiasm! 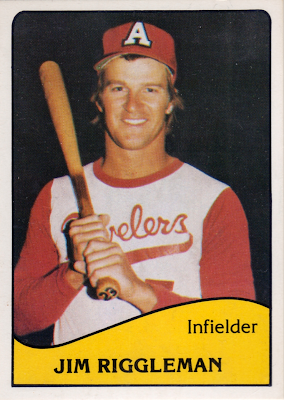 Looks like #23 emblazoned on the bat handle, even though Jim's uniform number is a single digit. Perhaps the photographer just said "grab one off the rack and let's shoot a photo?" Good thing he didn't pick up one of Billy Ripken's by mistake. So far, Riggleman has a better winning percentage managing the Nationals (.430) than he did in 2008 with my Mariners (.400). Washington won't have Stephen Strasburg this year, but still hopes to improve on a 69-93 record from 2010. Every team's tied on opening day, right? Value: This Riggleman cost $2 at MinorLeagueSingles.com, about right for a non-star from that era.